It would be a year long road trip, with just his Super 8 camera and a used Ford Coupe to keep him company as he traveled solo across the United States to photograph Eisenhower’s America, from the deserted towns of the midwest to the rich hills of Hollywood. Frank photographed everyday objects of American life – signs, cars, clothes, diners, people themselves – in both small towns and big cities to give a sense of the country’s mood at the time. From the uneasy glare of a couple, to the wishful gaze of a woman in an elevator, to the lonely dive bars, Frank transformed these every day incidents into stark black and white commentary on a nation at the verge of falling apart over nuclear destruction and racial divide. 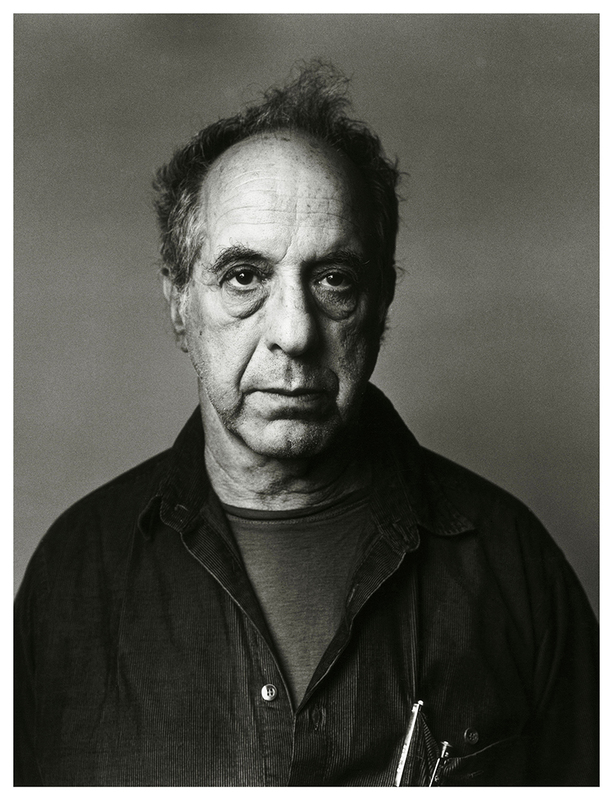 Frank was a part of the Beat generation and, like his peers, he was in search of that “other” America, to photograph the same America and its cast of freaks and outsiders that Kerouac was seeing on the road and what Ginsberg was howling about. 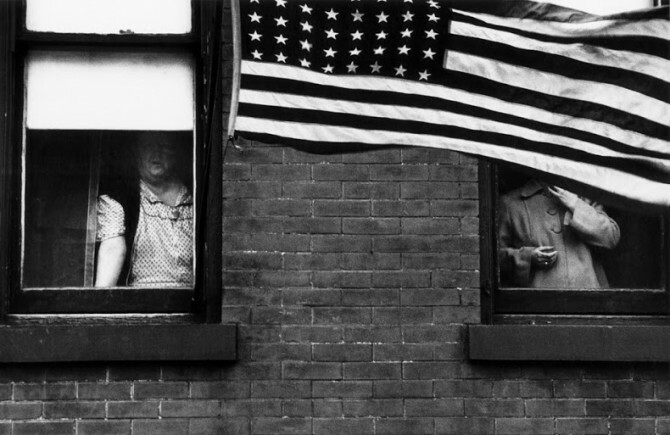 Frank chose eighty-three of those photos to appear in The Americans, his groundbreaking photo album which was first published in Paris in 1958 and then a year later in America. One of those twenty-seven thousand unused photos, a single shot of a collage of photos from supposedly a New York tattoo parlor, would be used in 1972 by another band of outcasts and outsiders. In 1972, Mick Jagger reached out to Frank and ask him to come to the Bel Air villa, the Los Angeles home where Mick and his band was staying while they finished their new album. 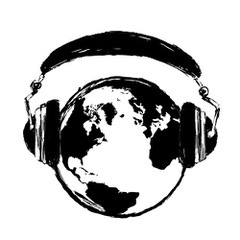 Their new album was something unlike anything they’ve done yet, something raw and uniquely American. 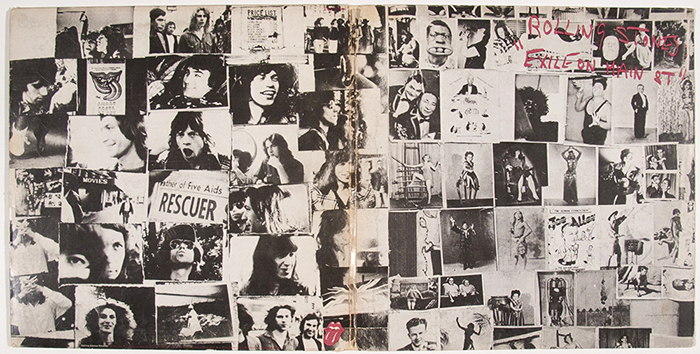 Jagger wanted its album cover to reflect the band as runaway outlaws using the blues as its weapon against the world. The album’s cover had to reflect this feeling of joyful isolation, grinning in the face of a scary and unknown future. It had to be perfect. 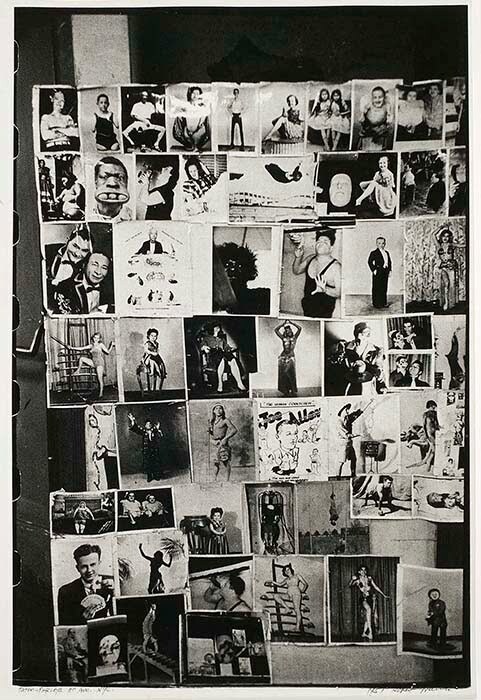 Frank was originally meant to shoot the band as they walked along the seedy Main St. of LA that they were supposedly exiled from, and those photos are all on the album’s back side where the band looks just as strange as the freaks from Frank’s photo. You can see more footage of those sessions here. However, his tattoo parlor photo caught the attention of John Van Hamersveld, who was hired by the Stones to put together the album package. Hamersveld had already worked with the Beatles and Hendrix and had already designed the classic poster for the 1966 surf documentary The Endless Summer, but Hamersveld knew right away that Frank’s photo, which he found among his many American outtakes, was destined to be used for this new album. Impressed with the photo, Hamersveld took Frank’s work and turned it into the famous album cover that we all know and love. It’s fitting that Frank, an exile himself, would create the image of one of the greatest works about exile and American life. Frank was also a filmmaker, and he filmed the band on their 1972 tour supporting the album he photographed. His filmed was called Cocksucker Blues and it was never officially released due to it being too obscene. Imagine that.